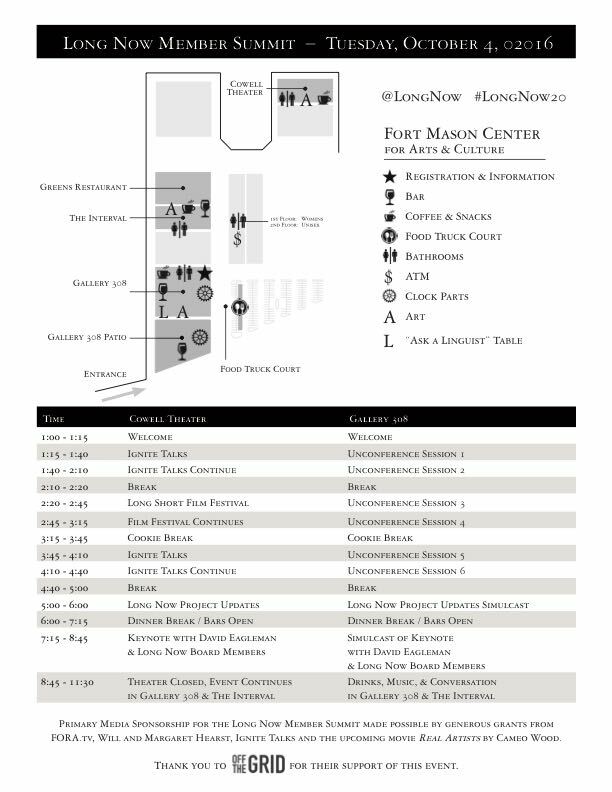 02016 marks The Long Now Foundation's 20th year and we are holding our first ever Long Now Member Summit to showcase and connect with our amazing members who number nearly 8,000 around the world. Thanks to the some special arrangements we will have some actual components from the Clock of the Long Now on display for the event. We'll close the Summit with a party including drinks from the menu of our bar, The Interval and a performance by the band Mission Delirium. For more than a decade Long Now has presented Seminar talks for our members, but at this Summit we'll give members the opportunity to directly participate in the programming. During the day there will be Ignite Talks by members and member-led unconference discussions. We hope you will join us October 4th to celebrate long-term thinking! We have selected a lineup of long-term thinking Ignite Talks from nearly 100 proposals by Long Now members. The talks will be presented in Fort Mason's Cowell Theater on the stage where our keynote will be delivered later in the day--and where so many Seminars About Long-term Thinking have taken place over the years. Their topics will range from eating bugs to petroglyphs to biotechnology to thousand-year-old books--all presented by Members of Long Now. This fulfills one of our goals of the Summit: to involve members directly in the programming. Our thanks to Brady Forrest, founder of Ignite Talks, for helping us curate and produce these talks. What's an Ignite Talk? It's a presentation that's exactly 5 minutes long, featuring twenty slides that auto-advance every 15 seconds (ready or not). The format is fast-paced and engaging and allows members to share their ideas and perspectives on long-term thinking. Another way we are promoting discussion between members is through the unconference portion of the Summit in Gallery 308. An “unconference” is an event format in which people sign up when they arrive at an event to lead presentations or discussions. Sessions are 25 minutes, and any attendee can sign up to lead one. The unconference sessions occur at the same time as the Ignite talks in the Cowell Theater - breaks are coordinated and we encourage members to move between the 2 areas of afternoon programming. To learn more about how the unconference works, check out our unconference FAQ. Primary Media Sponsorship for the Long Now Member Summit made possible by generous grants from FORA.tv, Will and Margaret Hearst, Ignite Talks, and the upcoming film Real Artists by Cameo Wood. Thank you to for supporting this event. Thanks to the members who have offered to volunteer for the Member Summit, applications are now closed. 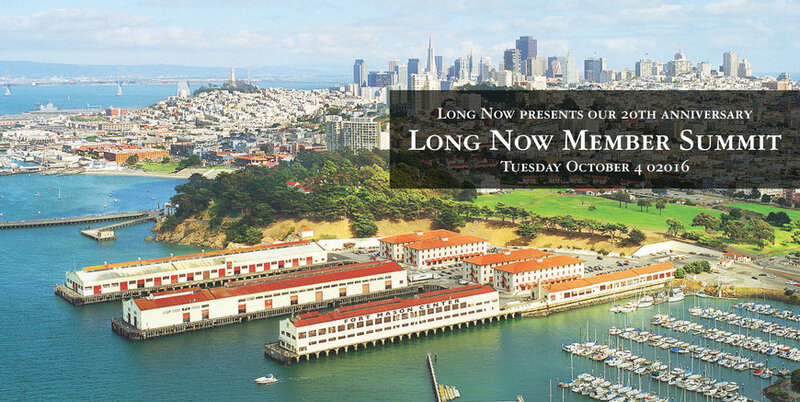 Long Now is always looking for volunteers for our other events, if you are interested in helping out, please email us at membership@longnow.org. Will I be able to sit during the event? I have a question that is not listed here, how do I reach you? Will there be an ATM on campus? Do you accept credit cards? Is this event open to the general public? What are the differences between different types of tickets? I don't see a way to get tickets, how do I buy them? I want to upgrade my ticket, how do I do that? Are my tickets tax deductible? Where is the event registration, and do I need my badge to get into the Cowell Theater, Gallery 308 and the Interval? What if I want to eat dinner somewhere else? Will were be options for vegetarians/gluten-free/lactose-intolerant? Will there be coffee, tea, snacks & water? I don't drink alcohol, can I still use my drink ticket? Will The Interval be open? How do I submit a proposal for the Ignite talks? Can I save my seat in the Cowell for later that evening? Tuesday October 4, 02016 from 1:00pm to 11:30pm. Registration opens at Noon. Fort Mason Center for Arts & Culture in San Francisco. Ages 12 and up may get the most of this event, but there is no part of the event where children will not be allowed. We recommend taking public transit to the event, but there is some parking available in Fort Mason Center. Please visit the Fort Mason site for more information on public transit & parking. We advise members to find accommodations as soon as possible as the fall is a very busy time in SF; hotels along Lombard Street in San Francisco are very close to Fort Mason Center. Please note that this event is taking place during Dreamforce, and hotels may be hard to find. San Francisco can go from 80 degrees to 50 degrees in half an hour, so we strongly recommend bringing ample layers to the event. Some of this event will take place outside, so we recommend sun protection, sunscreen & a water bottle as well. This event is taking place on federal land and the laws regarding service animals differ from those of the state of California. Please check the national laws regarding service animals before bringing your animal, as some of our venue hosts may not be able to let your service animal into the venue. Yes, although seating varies and may not be guaranteed in Gallery 308 for the projected simulcast of keynote. 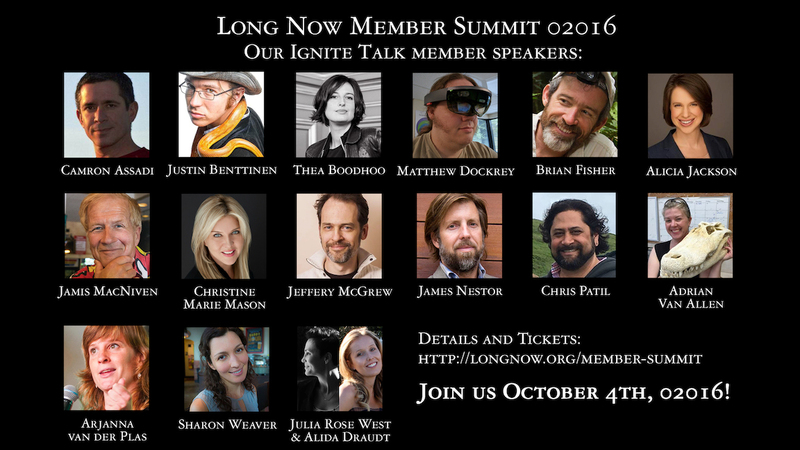 If you have specific needs, please email us membership@longnow.org. If your question concerns ticketing, email boxoffice@fortmason.org. 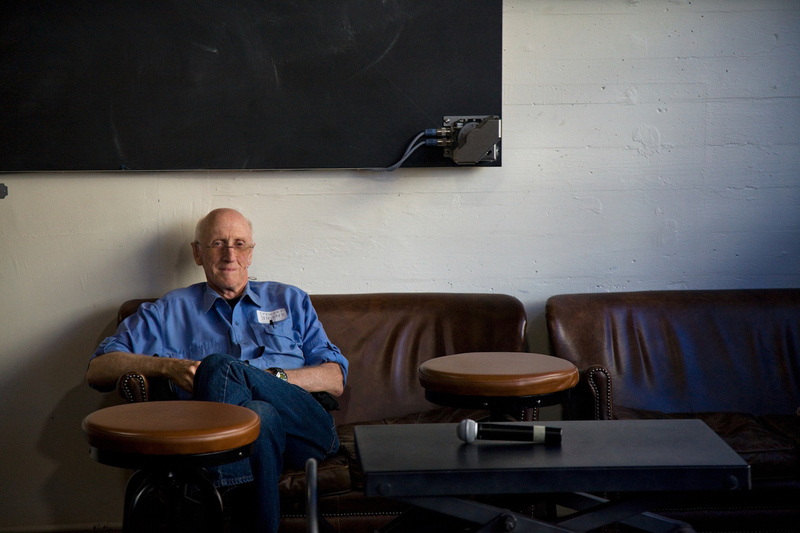 For all other inquiries, please email us at membership@longnow.org. No, this event is only for the Long Now Membership. Our total capacity is around 700 people, and we have thousands of members. If you would like to attend the Summit but are not a member, you may join for as little as $8/month here. Each member is able to buy 2 tickets. There are five ticket levels. The $75 Stainless Steel ticket level allows you access to the entire day of programming and live simulcast of the keynote presentation in Gallery 308 or The Interval. There will be bars at these locations, and in general this will be more of a social experience. The $125 Monel ticket level allows you access to the entire day of programming, and you will be able to watch the keynote from inside the Cowell Theater. Both options includes a dinner from an Off-The-Grid food truck, 1 drink ticket, and free coffee & snacks. The $500 Tungsten Patron Ticket gets you a reserved seat with your name on it in the Cowell Theater for the entire day and evening keynote, as well as a dinner at Greens Restaurant, 2 drink tickets, and a thank you gift from Long Now. There are two ticket levels for the evening-only programming which starts at 6pm. The $70 Theater Ticket allows you access to general seating in the Cowell Theater for the keynote. The $50 Simulcast Ticket allows you to watch the projected simulcast of the keynote in either Gallery 308 or The Interval. Both options includes a dinner from an Off-The-Grid food truck, 1 drink ticket, and free coffee & snacks. Buy your tickets here. You can only purchase tickets if you are logged into your member account. You can login here. Please email boxoffice@fortmason.org with your request. 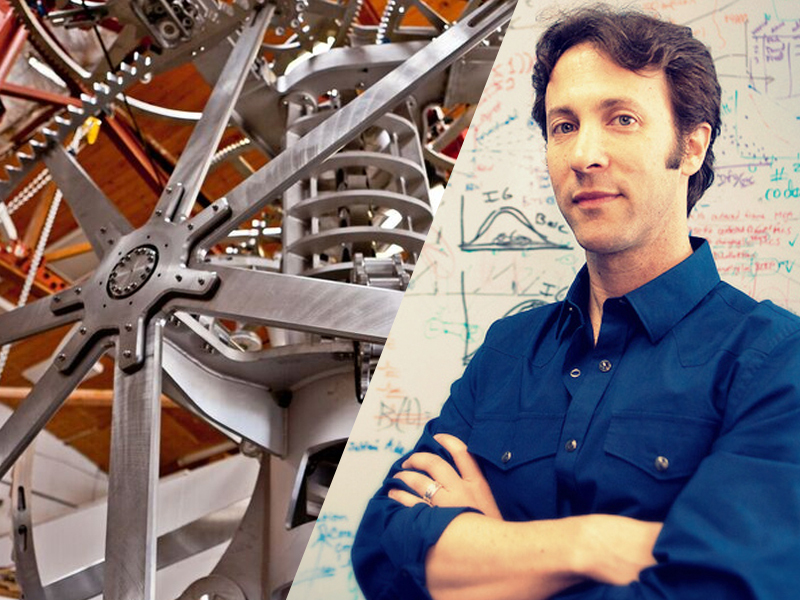 A portion of the Tungsten Ticket level is tax deductible, please email donate@longnow.org for more information. Event registration is in Gallery 308 in Building A. You will need your badge to enter all the indoor spaces of the event (Gallery 308, The Interval, Cowell Theater). Please pick up your badge before exploring the rest of the Summit. You are welcome to do so, but please note that there are not a lot of dining options in the immediate area. If you leave the Summit in the evening you are likely to miss some of the keynote or other programming. Will there be options for vegetarians/gluten-free/lactose-intolerant? Yes, but note that outside food is not allowed into the Cowell Theater. Yes, free coffee, tea, snacks & water are included with your ticket. Yes, we will have non-alcoholic drink options. Yes, but due to our 49 person capacity limit, there will also be several satellite bars around the Summit serving a selection of The Interval's signature cocktails. How does the unconference work? The member-led unconference will be held in Gallery 308 from 1:15 to 4:45pm. The unconference sessions occur at the same time as the Ignite talks in the Cowell Theater - breaks are coordinated and we encourage members to move between the 2 areas of afternoon programming. All unconference sessions sign ups happen the day-of the Summit. After you have arrived and registered, a sign-up board will be in located Gallery 308; Long Now hosts will be available to answer questions and help with the unconference. Sessions will run for 25 minutes each and we'll have larget format note-taking supplies on hand for everyone. Your session can be either a discussion or presentation, and we will have spaces of varying size to accommodate the different types of sessions. The deadline for Ignite talk proposals has passed. No. You cannot save a seat for the keynote. The only way to have a reserved seat for the keynote is by purchasing a Tungsten Patron Ticket.